For six years, IITA has been supporting the dreams and aspirations of many African youth by creating a platform that encourages them to choose a career in agriculture. The IITA Youth Agripreneurs (IYA) initiative, which started at the IITA Headquarters, Ibadan, Nigeria in August 2012 has grown; spreading tentacles across Africa and guiding vibrant, energetic, young people to become owners and co-owners of independent agribusiness enterprises. The Director General, Dr Sanginga screening some of the plans submitted by the youth. Many of these young people who were unemployed and underemployed before their encounter with the IYA initiative did not see themselves creating a career path along the agricultural value chains or embracing agriculture as a real business, but IITA availed them the opportunity to unveil their potentials in agriculture. Initially, many of them had a negative perception about agriculture, but IITA devised a means of changing their mindset by organizing trainings on agricultural commodities, business management, and leadership skills, and providing mentoring and facilities to explore available opportunities. Within a short period of time, the initiative recorded successes and became an adoptable model used by organizations and corporate bodies to execute youth in agribusiness projects. One of such projects is the ENABLE-TAAT project. The ENABLE-TAAT project, which is funded by the African Development Bank, is one of 15 Compacts comprising the Technologies for African Agricultural Transformation Program (TAAT) and led by Youth in Agribusiness Unit of the International Institute of Tropical Agriculture (IITA). Implementing one of the objectives of the project by providing support for agribusiness establishment and expansion, IITA is screening the business plans and ideas of the applications from agripreneurs seeking for funds to establish and expand their agribusiness enterprises. The exercise is being done in partnership with business experts from EKIMIKS Nigeria Limited and to date has selected 34 businesses out of the 51 applications received from Agripreneurs in DR Congo, Kenya, Nigeria, Tanzania, and Uganda. The enterprises were selected after review, grading, and recommendations based on key business elements and perceived viability. These young people will be provided with a certain amount of money, which will be used to start and expand their businesses. The funds earmarked for each enterprise will be disbursed to their business accounts in four tranches as loans and grants. 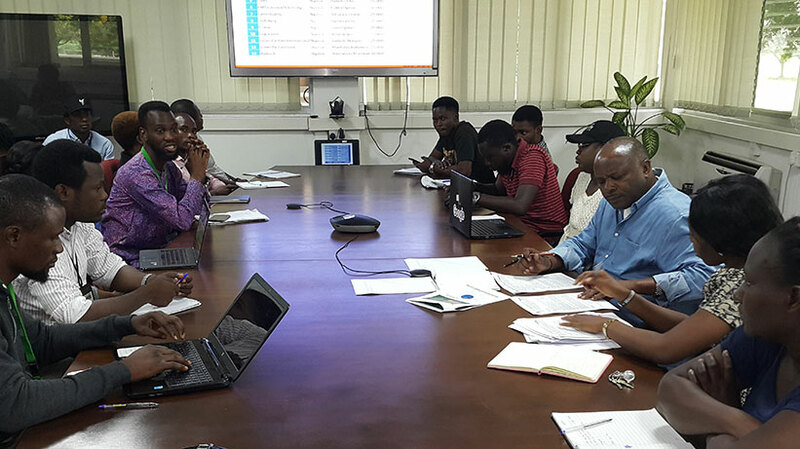 Gathering on Thursday, 19 July at the office of the Director General of IITA, Dr Nteranya Sanginga, some of the youth who spoke to the DG about their businesses stated their willingness and readiness to do great exploits in agribusiness. A co-owner of F-Step Cassava enterprise, Seun Ogidan, while giving an update on the business, stated that the company has acquired 15 hectares of land at Ago-Owu in Osun State to establish a cassava farm. The business, which is registered by the Corporate Affairs Commission, will be operated in partnership with another Agripreneur, Funmi Lamidi. She added that a sum of 600,000 Naira, which she borrowed from an uncle, has so far been invested in the business. She stressed that the partners are willing to expand their production to 25 hectares if they have access to funds. Taking a step ahead, the CEO of Gracevine Ventures, Abosede Idowu explained that she requires some funds for expansion and penetration of her business into a larger market in Lagos. Abosede who started her business in 2016 requires money to upgrade her packaging to meet up with international standards. She is also planning to invest some funds in cultivating cowpea to produce cowpea flour, a major raw material used in the production of her commodities. Gracevine Ventures located at Moniya in Ibadan, Nigeria produces Yam flour, Plantain flour, packaged stone less beans etc. Frotchery Farms, which is another spin-off from IITA Youth Agripreneurs, has been progressing well within a short time, venturing into the business of catfish smoking. The business is owned by three young graduates—Ngozi Chituru, Babatunde Ismail, and Oni Hammed and is planning to acquire about 17 ponds to enable them to have access to raw materials. The business has existing markets, but is facing challenges in meeting demand due to the non-availability of the required sizes of catfish. Since inception a year ago, the business has realized a revenue of $18,000, penetrated 12 states in Nigeria, and three countries. It has also launched a website to enhance the visibility of the company. The business has provided direct employment opportunity for 3 youths indirect employment for 26 others through retail, distribution and sales. Others in the category also expressed their intentions along the value chain of various crops and livestock that include bread production, Snailery (production, processing, and packaging), cowpea grain and seed production, rice production, maize aggregation, plantain flour production, plantain chip production, and maize seed and grain production. Addressing them at the meeting, the DG Nteranya Sanginga enjoined the young people to be humble and work as a team. He encouraged them to always support each other as they all need one another to grow in the business. Similar opportunities are being given to the Agripreneurs in East, West, and Central Africa to pitch their business ideas before a panel at an agribusiness workshop slated to take place in Nairobi in August. Adequate monitoring and evaluation will be carried out for further checks and balances, backstopping to monitor the growth of the businesses.